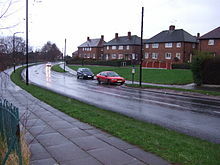 Council houses at Hackenthorpe in South Yorkshire. Some developments have become run-down like these flats being demolished in Leeds, West Yorkshire. The council house is a form of public housing found in Ireland and the United Kingdom, sometimes called social housing in modern times. Council houses were built and operated by local councils to help the local population. As of 2005, approximately 20% of the country's housing is owned by local councils or by housing associations. The largest council estate in the country (and one of the largest in the world) is Becontree, Dagenham, with a population of over 100,000. Building started in the 1920s and took nearly 20 years to finish. The Republic of Ireland has a similar public housing system, Local Authority Accommodation.